Land of Plenty’s win in the Group 1 Toorak Handicap over 1600m, to capture his first win at racing’s elite level, has made sure Victorian breeder Clive Smith hasn’t left cloud nine since the moment his pride and joy crossed the line. With a background in information technology and currently developing software for the thoroughbred industry, Smith has always had a keen interest in horses: initially taking a 10% share in a $10,000 horse back in the mid-1990s. Taking it up a notch or three, Smith purchased a small property at Strath Creek in North East Victoria some five years ago, with the aim to spell his racing and breeding interests. The farm currently plays host to five broodmares, including the dam of recent Group Three winner Moss Trip as well as a close relation to Group One winner Tavago. But it’s Land Of Plenty, not surprisingly, which holds centre stage for Team Smith who named the handsome stallion after the Men At Work lyrics from ‘Down Under’. Bred and sold by the Esplin family (operating under Tartan Fields) for $80,000 at the 2015 Inglis Australian Easter Yearling Sale, Land of Plenty was subsequently placed in the 2017 Inglis Chairman’s Sale Racing Prospects where Smith secured his majority share for just $32,000. “I really liked the look of Land of Plenty at the yearling sale and he showed plenty early on winning at his second start over 1400m at Geelong,” Smith explains. Despite Smith’s show of faith, Land of Plenty had failed to win for 580 days – 15 starts, 19 months – since Geelong, prior to winning comfortably at Bendigo in April this year. “He (Land of Plenty) has had a new lease of life with Darren (Weir) and, since that win in April, has won four including the Toorak, the Group Three RA Lee and Listed Chandler Macleod, plus running a lip second to Osborne Bulls in the (Listed) Regal Roller and a head third in the Group One Sir Rupert Clarke three weeks ago,” Smith adds. Land of Plenty is out of the Spectrum mare, Dancing, a Group 2 winner in the USA who has had eight winners from eight to race. His Street Cry half-brother, Macduff, is a stakes winner in South Africa, while another daughter is the dam of a Group winner in Brazil. Dancing is also closely related to dual Group 1 winner Zavite, plus Champion three-year-old and sire, Suave Dancer, along with Grand campaigner Hartnell (GB) who ran second in the Toorak, interestingly shares a family connection with Land of Plenty through the mare Guinevere’s Folly (USA), who is Land of Plenty’s third dam and Hartnell’s fourth. Darren Weir’s recent record in this race is remarkable having now won four of the past five editions, with two of those winners, Swettenham’s Trust in a Gust and Woodside’s Tosen Stardom now at stud in Victoria. 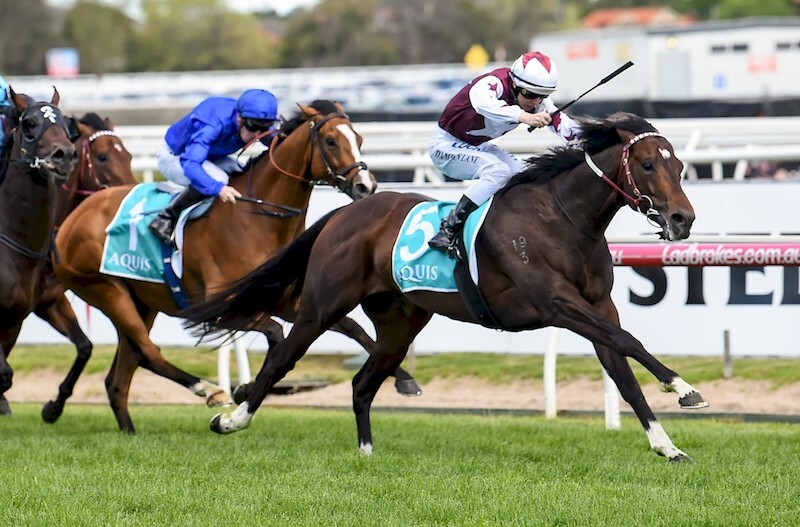 “He was set for the Toorak, so it’s good that he’s been able to get the win for the owners. He’s a great type of horse, he’s got a nice pedigree, he’s still a stallion and now he’s a Group 1 winner.” Weir said.